Youngsters learning how to catch fish wharf and jetty fishing is an important part of growing up in New Zealand. This is where most of us start out as anglers like these two boys on a brilliant sunny day at Oamaru. Despite being a surfcasting fanatic I still find tiddler fishing irresistible. I guess a summer afternoon spent, rod in hand, dangling your feet over the side of a wharf is something you never grow out of. Lyttelton Harbour is just twenty minutes by car from Christchurch. The last two kilometres of the journey being through New Zealand ‘s longest road tunnel. During summer the harbour is teeming with juvenile fish – otherwise known as “tiddlers.” On a recent outing to Lyttelton (for the sake of the kids), we caught: red cod, yellow-eyed mullet, blue warehou, spiny dogfish and a poisonous green pufferfish. The majority of which went back into the water alive. A catch of tiddlers from the Lyttelton wharves: warehou, red cod and a yellow eyed mullet. The secret of successful tiddler fishing, especially when taking the kids out for a fish, is to use very small hooks. Size 6 – 10 is a good size to use for most fishing as these are ideal for catching yellow-eyed mullet. These hooks are tiny, but they will still catch fish in excess of four pounds. It always amuses me to watch people fishing from the wharf with 5/0 hooks. They never catch anything. Their hooks are too big to fit into the mouth of the fish. Every time they wind in their line their bait is gone but they never seem to work out why! 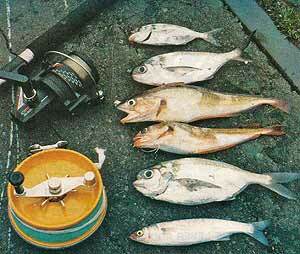 So what then is the best size small hook for wharf and jetty fishing? A size 8 trout nymph hook is perfect. It will fit on the top of a 10 cent coin. The gap from the tip of the barb to the hook shank is 6mm. Overall the length measures 19mm. There are lots of different hook shapes. A similar size Suicide hook is also very good. Nowadays most sea-fishing hooks are chemically sharpened and come in red or black. Both colours are good and work just as well. The important thing to look at is the hook gap. Choose one that measures 6mm and you will start to catch a lot more fish. Sure, these hooks seem very small but I have caught 20 pounds plus rainbow trout on size 8 nymph hooks. Fish like yellow-eyed mullet and garfish have quite small mouths. If your hooks won’t fit inside the fishes mouth it will be almost impossible to catch them – though you might foul hook a few small fish from time to time if your large hooks are really sharp. 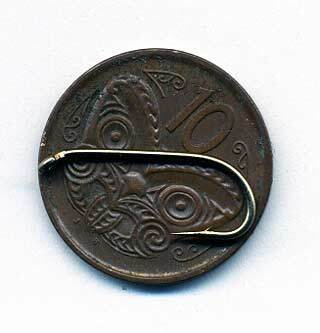 A size 8 Black Magic nymph hook will fit on top of a 10 cent coin. It is small enough to fit into the mouths of small fish but is sufficient to catch larger fish too. If you are getting a lot of nibbles and losing all your bait without catching anything it is because your hooks are too big for the fish. As for bait, little fish will eat almost anything. I use frozen mullet or whatever else I can find floating around in the bowels of the freezer. Squid is always good as it is easy to store and cut up into small baits. The most important point about the bait is that it be cut up into little cubes to match the small hooks. When you bait up always ensure the barb is left exposed. Hours of fun can be had from this type of fishing. The tiddlers keep biting one after the other. It is surprising the amount of fight a four-inch warehou can put up on a light rod and two-kilo line. Tiddlers are not the only fish in the harbour. Over the years I have caught many good size red cod. However, the prize catch now is the returning quinnat salmon that were released into the harbour a couple of seasons back. Some of these fish now weigh in excess of 3 kg. 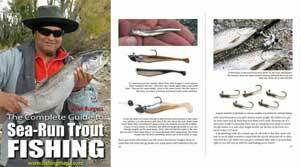 Conventional wisdom has it that the way to catch salmon is by either jigging or spinning with lures. They will, however, take baited hooks simply hung over the side of the wharf. A drop net is essential if you hook a big fish. 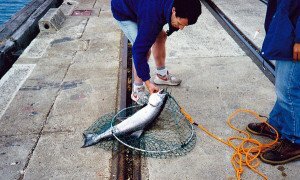 Without the drop net, you risk having the hook pull out of the fish as you lift it from the water. What you definitely do need, is a drop net. There are no readily accessible stairways down to the water. If you attempt to simply lift the full weight of the fish the twenty or so feet up to the wharf, you will lose it for certain. Either the hook will pull out or the line will snap. A drop net can be made at home from the following items: an old bicycle wheel rim, with the spokes, removed; 15 metres of nylon rope, about 100 kilograms or stronger; and a landing net bag. Cut three or four, one-metre lengths from the rope and tie them at equal distances around the wheel rim. Bring the opposite ends together and fasten them to the remainder of the rope. Finally, tie the landing net bag to the bottom and you’re in business. The main advantage of the drop net is that it allows you to fish with much lighter tackle. If you think you can get by without one, just wait until you have a salmon drop back into the water as you tried to lift it up to the wharf, you’ll be rushing out to make one. The drop net is also good for catching crabs. Tie a lead sinker to the bottom of the net. Tie some bait like an old fish head or frame in the centre of the net and lower it to the bottom. Wait for a few minutes for the crabs to start feeding on the bait and then lift the net. On the weekends there can be a big crowd of hopeful anglers trying their luck at Lyttelton. Most hurry down to the ends of the wharves. That’s not where the fish are. In my experience better catches can be made from the end closest to shore. Here the little fish find abundant food and shelter among the rocks and wharf piles. You can even entice them out towards your baited hooks with berley made from toasted bread crumbs: Looking over the side of the wharf, you can clearly see the little tiddlers dart out in search of a free meal. Berley, in an onion bag, can be lowered down to just under the water to attract fish. Any old bits of fish, guts, bread crumbs, and the like will work well to bring small fish around. Another way of attracting fish to your hooks is to use liquid berley tossed on the surface of the water. You need two twenty litre buckets. The first bucket contains your frozen berley. Lower the second bucket down on a rope so it fills with water then haul it back up. Mix some of your frozen berley into the bucket of water and stir with a stick. Every five minutes or so cast a cup full of this mixture down across the water below. You will be amazed at what a difference this will make. Often you can attract big schools of mullet, and other fish, with this method. Using berley will always be more effective than fishing without it. A drop net is an essential item of kit when fishing the wharves in Otago Harbour. During days spent fishing at Lyttelton around October and November, the water was thick with whitebait. Unfortunately, I had no suitable net to scoop them up. Lyttelton Harbour offers something for everyone: spinning for salmon and kahawai; live-baiting for kingfish from the breakwater. And my old favourite, tiddler fishing. Sadly fishing from the Lyttelton wharves is now a thing of the past with virtually the entire inner harbour having been fenced off to prevent public access. The New Brighton Pier is another good place to take the kids fishing for tiddlers. It will help if you can distribute berley on the surface of the water. Also, use the small hooks. If your bait is disappearing but you aren’t catching anything always suspect that small fish are pinching your bait. The answer is to use smaller hooks. In an update to this article sadly the wharves at Lyttelton Harbour have been closed to public access. There are lots of other places you can go to catch tiddlers. For example the New Brighton Pier. The wharf in Kaiapoi is a great place to catch mullet on small hook around high tide. Encourage kids to release unwanted fish. If you don’t intend to keep a fish to eat or use as bait then quickly return it alive to the water. Pointed long-nose pliers used to remove the small hooks from a fishes moth are a good investment and only cost a few dollars. They will greatly reduce the chances of getting a hook in the finger. Holding small fish like spotties upside-down stops them from struggling making it much easier to remove a hook from their mouths. Pick up a copy of the fishing rules for your area in brochure form or download a copy from the MPI website. According to MPI (Ministry of Primary Industries), “Everyone who fishes recreationally in New Zealand has a legal requirement to follow the recreational fishing rules. The rules change regularly – so check the rules for your fishing area every time you head out fishing.” MPI will even give you a free stick-on 75cm ruler for measuring fish. The fishing rules in New Zealand vary depending on which part of the country you are in making it essential to read the correct brochure for your area. For example, in Canterbury, you can use more than one rod and use up to 25 hooks. 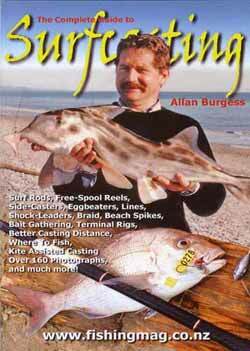 Whereas in the Marlborough Sounds anglers are restricted to one rod each, and you are only allowed 2 hooks. In this video clip Malcolm Bell, from The Complete Angler tackle store in Christchurch, has some great tips for taking kids fishing to catch tiddlers.